There’s no doubt about it, Spekboom (Portulacaria Afra) is a very special plant. Also known as Pork Bush or Elephant’s Food, this indigenous evergreen is an environmental miracle worker, with the potential to tackle carbon emissions like no other plant can. Whether you’re a succulent fan or have yet to hear about this magnificent tree, here are 5 things you probably didn’t know about this wonder plant. It is found predominantly in the Eastern Cape, and especially in the semi-arid Karoo region, where growing conditions are ideal for this resilient plant. It favours North-facing slopes where it is exposed to maximum sunlight. Thriving in poor soils, it tolerates both drought and frost. Hectare for hectare, Spekboom thicket is ten times more effective than the Amazon rainforest at removing carbon dioxide from the atmosphere. One hectare of Spekboom can sequester between 4 and 10 tonnes of carbon per year. This makes it a powerful tool in the fight against climate change and the move towards a zero-carbon world. And Spekboom trees can grow as tall as 5 metres. Prior to the advent of large-scale livestock farming, some areas of the Eastern Cape had Spekboom forests so thick that it was said a grown human could walk across the top as if walking on a carpet. Spekboom propagates very easily, and a broken-off branch can quickly grow roots and create a whole new plant. In the wet, cool months, Spekboom photosynthesises like other plants, opening its stomata during the day to absorb carbon dioxide. During drier times, the plant has the ability to open its stomata at night in order to prevent water loss during the heat of the day.  It is a favoured food of black rhinos, elephants and kudus. The good news is that we can eat it too. With a slightly lemony taste, Spekboom leaves are juicy and full of moisture, making them the perfect ‘pick-me-up’ during a long day’s hiking in the arid Karoo. Popular Cape Town restaurants like the Pot Luck Club use this succulent as accents to their beautifully crafted dishes. How can Spekboom be used for conservation? Due to its multiple beneficial properties, Spekboom is a favoured plant for landscape restoration projects. One such programme is located in the Eastern Cape’s Great Karoo at Samara Private Game Reserve. Consisting of 11 former livestock farms, one of the reserve’s vegetation biomes is the Valley Thicket. 200 years ago, this biome would have been home to impenetrable Spekboom thicket. Today, overgrazing by goats and sheep has denuded the landscape of much of its vegetation, leaving only pockets of Spekboom amidst the bare red earth. 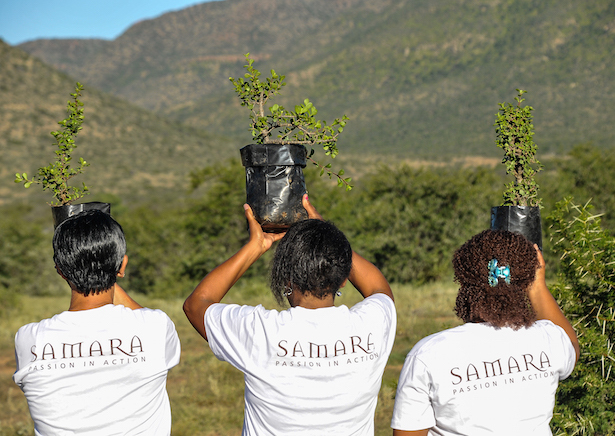 Samara’s mission to actively restore its degraded landscapes has focused on the planting of Spekboom in previously overgrazed areas. Not only is the plant indigenous, but its roots act to compact the soil, preventing it from being washed away. The benefits are multiple – better-quality soil, ideal conditions for the growth of grasses and other plants, forage for wildlife, and of course climate change mitigation. 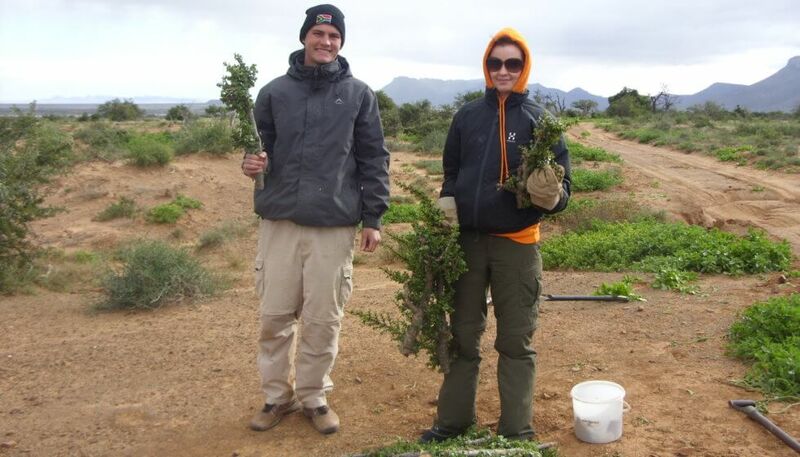 In May 2010, the first batch of Spekboom was planted on the reserve by a class of learners from Spandau Secondary School, Graaff-Reinet. Since then, Samara has worked with the University of Stellenbosch and other scientists to develop a Spekboom conservation model that ensures the highest rate of success and plant survival. Samara’s volunteers, staff and guests take part in this planting project as a means of offsetting their carbon debts. Ultimately, Spekboom planting could provide an opportunity for carbon sequestration and job creation on a much larger scale. 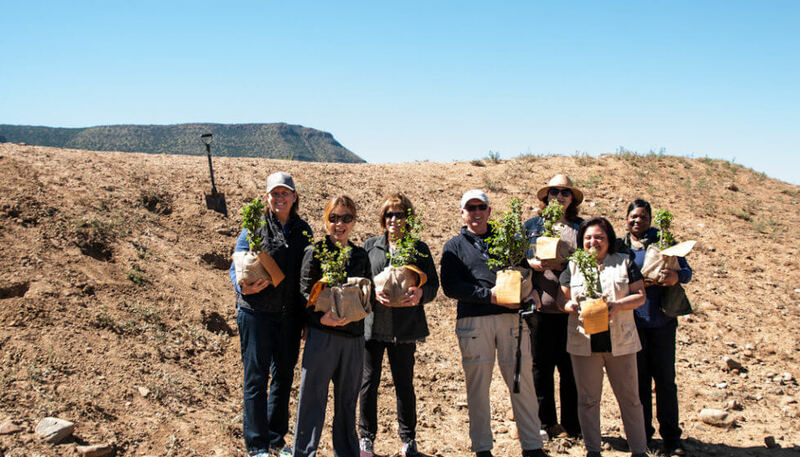 As part of Samara’s collaborative conservation initiative, the reserve has launched a Spekboom planting project that anyone can get involved with. All you have to do is join our mailing list and let us know when your birthday is. Then, when the time comes, we will plant a Spekboom in your honour. The more birthday Spekbooms we can plant, the more successful the project will be. With your help, we can rewild one of South Africa’s most spectacular environments. Samara Private Game Reserve is a luxury 5-star destination with a passionate conservation mission set within breathtaking wilderness. Follow us on Facebook, Twitter, Instagram or click here to start planning your stay with us today. A safari for the soul. Hi, I absolutely love this tree. I would, however like to know when to transplant my Spekboom that is rootbound. I live in Noordhoek in the Southern Peninsula. Appreciate your response. Best time to transplant is harvest to spring time. Dear Anne, apologies for the delay in getting back to you! As Clark mentions below, in our experience you can plant at any time of year. The easiest way to do it is to get a cutting and place it in water until it begins to grow roots, and then to transplant into potting soil. Can somebody give us a recipe for spekboom jam please ! Great question Carrina! We’ll keep our eyes peeled for one and keep you updated. Hi! I heard the Spekboom with the red stem is of particular medicinal value, would you agree? Hi we have added small potted plants to each of our bed and bathrooms in our guesthouse to assist with freshness inside. Yes indeed they do grow very easily and most guests sometimes leave with a plant to take to their homes.